Sunrise over stromatolites in Shark Bay, Western Australia. Ancestors of the microbes in these biochemical structures contributed to the oxygenation of Earth’s atmosphere. Image credit: Ariel Anbar. The history of oxygen is the history of life on Earth. For the first ~2 billion years of Earth's history, the atmosphere and oceans were largely devoid of free oxygen (O2). This changed ~2.4 billion year ago, when photosynethesis of primitive cyanobacteria caused the Great Oxidation Event (GOE). This event, the exact timing and tempo of which are still uncertain, marks one of the most profound changes our planet has ever undergone: persistent oxygenation of the oceans and atmosphere. However, the GOE does not represent the first incidence of free oxygen. Evidence for transient "whiffs" of oxygen prior to the GOE suggests the even more ancient occurrence of photosynethesis. 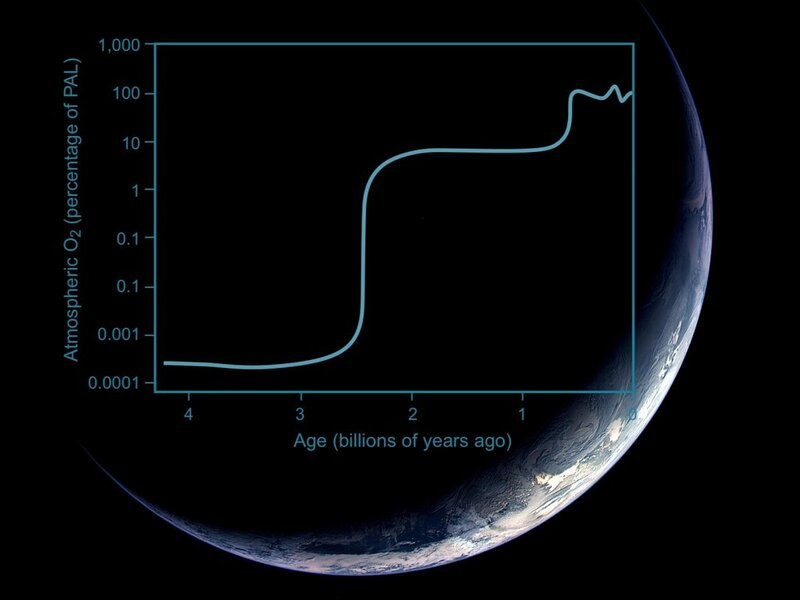 A simplified illustration of Earth's atmospheric free oxygen composition through geologic time shows that, following the initial oxygenatin during the GOE, atmospheric oxygen did not reach levels comparable to today until ~600-400 million years ago. comparable to today until well after this, however, sometime 600 - 400 million years ago. Our group is looking for evidence of the earliest “whiffs” of O2 to determine when photosynthesis began to oxygenate the environment. When did O2 first appear at Earth's surface? Once it was available, how stable was it in the atmosphere? What about in the oceans? We interrogate the history of oxygen on Earth using a variety of scientific methods, ranging from elemental and isotopic measurements in ancient sedimentary rocks, paleoredox proxies, experiments at extremely low levels of free oxygen, and modeling of the ancient Earth system. Our interest in atmospheric oxygenation is not restricted to early-Earth, however, nor is it restricted to Earth's surface environment. We are also keenly interested in perturbations in atmospheric and oceanic oxygenation well after the GOE, as well as the role of the solid Earth in driving these changes over geologic time. A ~2.63 billion-year-old black shale sample with layers of pyrite ("fools gold") from an Australian drill core. Certain marine sedimentary rocks capture and preserve key chemical details of Earth's ancient oceans and atmosphere. For example, the abundance of redox-sensitive trace metals can provide invaluable information about changes in atmospheric and oceanic oxygenation. Our group uses drill cores from deep ocean sediments to assess elemental abundances through time. Corals incorporate isotopes from sea water during growth, which can later be used to infer sea water composition through time. Some natural processes preferentially incorporate lighter or heavier elemental isotopes. This selective incorporation is called "fractionation," and evidence of it is sometimes preserved in the ancient rock record. If the process resulting in isotopic fractionation is linked to the availability of O2, the record of fractionation becomes a powerful tool in reconstructing Earth's oxygen history. The isotopic composition of marine sedimentary rocks can provide especially robust records of ancient conditions. To date, our group has developed and refined the use of Fe, Mo, Tl, and U isotopes as paleoredox proxies for perturbations in ancient Earth O2. Experimental setup for Ph.D. student Aleisha Johnson's low-O2 pyrite oxidation experiments. Experiments under simulated early-earth conditions provide unrivaled information about how changes in the environment are reflected in the ancient rock record. For example, experiments can be conducted under O2-deficient conditions to test the viability of alternate oxidation pathways, or to estimate the rate of elemental delivery to the ocean in a dominantly anoxic atmosphere. We conduct isotope ratio measurements using a Thermo Neptune Multi-Collector Inductively Coupled Plasma Mass Spectrometer (MC-ICPMS). For details about our instrumentation, sample preparation, and analyses, please visit the website of the W. M. Keck Foundation Laboratory for Environmental Biogeochemistry. Forbes interview about O2 and the NSF FESD project.